Hematite is another crystal most people don’t consider using for luck or abundance. As Hematite works to balance the energy bodies and transform negative energy it can be extremely useful for clearing a poverty mindset. Combine it with a crystal that attracts abundance and you’re set! Hematite Crystals have an excellent grounding and balancing energy... as well as being a powerful aid to stimulate the mind. They enhance memory and evoke deep thought. They have a highly protective energy and are good to help women who lack courage. If you desire to stimulate your mind for higher learning, they are most helpful, especially in the field of mathematics and technical studies. They will assist the development of logical thought processes, and help you to reach the highest capacity possible. They will heighten self confidence, will power and self-esteem. The energy of these stones have a strong physical grounding energy, that vibrates strongly at the base or root chakra. Hematite crystals will help to relieve any spaciness you may feel especially if you have been working with high vibration crystals. Using these grounding crystals will help to settle you and totally ground your energy to earth, as they help you to make a stronger connection to the earth. By taking any excess energy down via the base chakra to the earth chakra... and to Mother Gaia, this will help to prevent any health problems that can develop. This stone is highly protective, and is useful to protect and seal your aura field to prevent intrusion from unwanted entities while undertaking spiritual journeying. 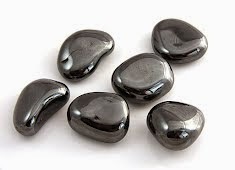 If you have been using high vibration stones, especially stones that stimulate the third eye and crown chakra, Hematite crystals will ground you spiritually on your return. These crystals can be beneficial to stabilize your energy field, to allow you to keep your connection both with Mother Gaia and with spirit. The energy of this crystal will help to balance your aura and align your chakras, as it brings together the energy of the mind, body and spirit. Sometimes when you work with high crystal energy stones you can become dreamy or spacy and lose yourself to the high vibration energy, instead of integrating it throughout your entire chakric system. Hematite Crystals can be very helpful to assist you to embody the high vibration energy while at the same time aiding you to let go of any excess of energy. This is important as spaciness can make it hard to operate effectively, and to get on with day to day living. Hematite crystals are not just for grounding as they aid you to integrate the energy of the physical and the spiritual. This type of grounding helps to bring the flow of light energy down from the higher chakras and throughout the entire body. Lightbody energy is highly beneficial if it is balanced, rather than allowing it to be diffused erratically. It is not simply good enough to work with the high vibration energy, which is all very nice, but it is also important to bring through the energy of spirit to the physical to manifest within your life. Use it in meditation, to aid tranquility and help to calm your thoughts. These stones are said to embody both the yin and the yang energies... the male and the female energy, which require being in balance for good health. They are very beneficial to remedy yin imbalances in your system, and are also helpful to aid you to let go of negativity and feel more at peace. Hematite crystals is an excellent female stone... assisting timid women to have heightened confidence and self-esteem. Health problem that are aided by using them include their action to strengthen the liver and to support the health of the spleen. They are also helpful to aid you to overcome addictions. They are said to be very helpful to aid problems in the blood system, and blood disorders such as anemia, and are known to be helpful to assist you to absorb iron. This crystal is said to aid in the formation of new red blood cells, as it helps the production of blood within the bone marrow... and it has a good action to ensure that broken bones or fractures heal properly. If you use it at the solar plexus also known as the power chakra, this energy may enhance your willpower and personal magnetism. It is a good idea to carry a piece on the body to enhance your health. 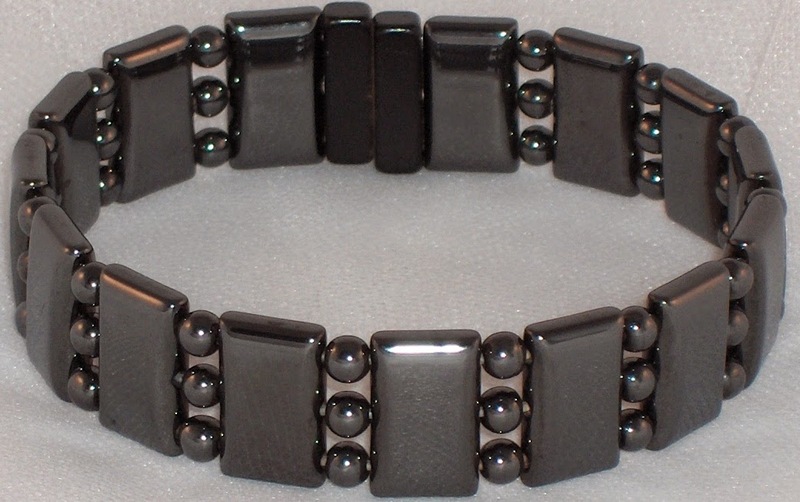 The use of the hematite magnet bracelets or pendants may be an easy and highly beneficial way to use these stones.